Amazon.com description: Product Description: Despite Heidegger's identifying his own thought with 'ethics' in the most original sense, his understanding of ethics has been criticised both for its supposed ignorance of the role of the other human being and for its relation to politics. This book contends that, in fact, it is Heidegger's own notion of 'being-with' -his rethinking of intersubjectivity- which demonstrates precisely what is wrong with his early work and demands that the place of ethics be rethought. 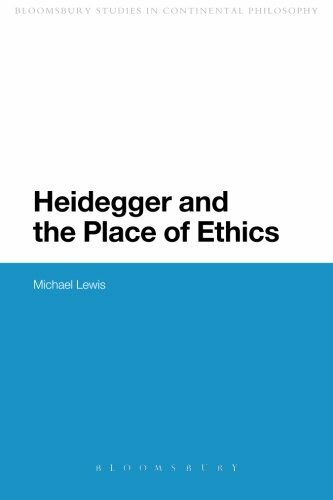 Heidegger and the Place of Ethics shows how this rethinking occurs in Heidegger's own laterwork. In particular, the crossing out of the earlier work in the turn to the later allows us to think 'being-with' as essential to a Heideggerian ethics and to rethink the relationship between ethics and politics which previously issued in Heidegger's engagement with Nazism. This rethinking of ethics and politics in light of the originality of 'being-with' brings us before a hitherto unnoticed proximity between Heidegger's later work and the Lacanian political thought of Slavoj Zizek among others; it thereby opens up the possibility of a politically progressive Heideggerianism, and many unexpected encounters with thinkers generally considered to be separated from Heidegger by an abyss. About: Despite Heidegger's identifying his own thought with 'ethics' in the most original sense, his understanding of ethics has been criticised both for its supposed ignorance of the role of the other human being and for its relation to politics.